The Singapore Institute of Technology (SIT), set up for polytechnic graduates, will become Singapore's university in the north-east and be integrated with the creative industry cluster that will rise up there. SIT, which now runs its courses at its satellite campuses in the five polytechnics, will have a centralised campus in Punggol, announced Prime Minister Lee Hsien Loong last night. Residents there will get to use SIT's facilities, including classrooms, workshops and a multi-purpose hall. "We have Punggol 21 Plus. With SIT, it will be Punggol 21 A-Plus," he said, drawing laughter from the audience gathered at ITE College Central in Ang Mo Kio to listen to his National Day Rally address. Punggol 21 Plus refers to the plan to transform the former fishing village into a model town for 21st century living. Mr Lee also announced that SIT's yearly intake will rise to 3,500 over the next five years, up from this year's intake of 2,000 students in over 30 courses. This is in line with the Government's promise to enable 40 per cent of each age group to study for full-time degrees in the six local universities. Mr Lee did not say when the Punggol campus will be ready, but said it will be linked by bridges to the creative industry cluster that will be built by developer JTC across the road. "Students can easily go from classroom to workplace and apply what they learn, and companies can go to SIT to get help if they need some new idea or some problems solved," said Mr Lee, highlighting SIT's distinctive education model which integrates work with study. SIT aims to nurture "best-in-class specialists" - graduates with deep knowledge and skills in a particular field - and requires students to spend eight months to a year on a work-study programme designed to be more in-depth and structured than traditional attachments. Mr Lee said SIT's focus on applied learning is in line with the Government's SkillsFuture initiative to build deep skills and expertise in Singaporean workers. He cited SIT graduate Chen Zhangkai, 27, who went from the Institute of Technical Education (ITE) to polytechnic and then SIT, as a prime example. Earlier this year, the Government announced several schemes under the initiative, including the Earn and Learn Programme where ITE and polytechnic graduates can further their qualifications while working. "SkillsFuture will produce more success stories like Zhangkai," said Mr Lee, but quoted a Chinese proverb to stress that it is a long-term endeavour. "We are planting for the long term, planting seeds now to bear fruit many years from now." Two Punggol residents interviewed welcomed SIT's move there, saying higher education institutions are now mainly in the west. The National University of Singapore, SIM University and Nanyang Technological University have their campuses in the western and north-western parts of the island; while SMU has a campus in Bras Basah. The Singapore University of Technology and Design opened its campus in Changi in May. Said Mr S. Suppiah, 35, a manager, who lives in Punggol and has two children in primary school: "It is good that the Government is spreading the higher-education institutions around." When contacted, SIT president Tan Thiam Soon said the university is extremely grateful for the land. 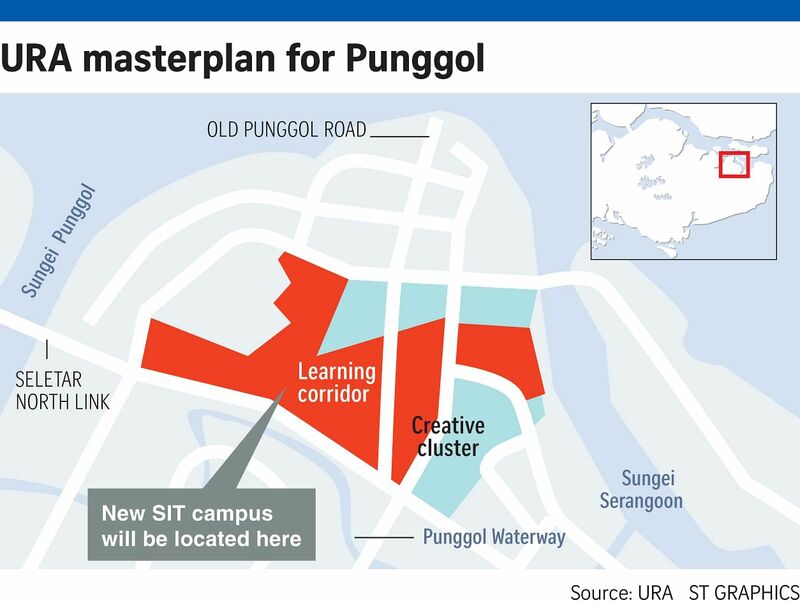 He said: "SIT's Punggol campus will be borderless and integrated with the surrounding community and industry, providing a vibrant learning environment which underpins the applied learning pedagogy that we are developing. "We will work closely with all the relevant agencies as well as community groups to ensure that the campus becomes a beacon for industry, adding vibrancy to Punggol and turning it into a true university town."